Well, that was me today. It’s been a weird kind of day, to be honest. It started last night, actually, when, in anticipation of the last day of my summer community nutrition internship, I woke up at 4:00 AM feeling like an agitated chimpanzee was bouncing off the walls of my brain. Was I prepared to have my supervisor sign off on the 16 competencies I was supposed to meet by today? What about the final group presentation next week? Are we ready? What more needs to be done? These and about 900 other concerns went tornado-ing around in my head, preventing me from falling back asleep until about 45 short minutes before my 6:15 alarm. As you may have experienced, sometimes you almost feel worse getting that small amount of sleep before your alarm. Sometimes it’s actually better just getting up ridiculously early and toughing it out. Feeling the drain of a craptastic 4 1/2 hour night of sleep, I dragged myself out of bed by sheer willpower and somehow made it to my internship site by 7:30, where a morning of outdoor work awaited me. The community center where I’ve been interning offers a once-a-month food box pickup, and this time I was assigned to direct traffic, pass out surveys, and help with set-up and tear-down of the event. By about 8:00, I would describe my mental/emotional state as “Not Enough Coffee In The World.” I’m pretty sure in my exhaustion I was gruff, if not actually rude, to the sweet fellow intern I was working alongside. (Did I mention it was over 100 degrees before 9:00 AM?) When 10:30 rolled around and we were finally done heaving extra cabbages into grocery bags, determining where a particularly foul smell was coming from–ah, yes, it was the potato sack dripping with rotten goo!–and wrestling pop tents back into their bags, the smell on all of us was INTENSE. (Probably rivaling the rotten potato goo, as a matter of fact.) Hence my secret satisfaction at just how terrible I can smell. Aren’t you glad you’re reading this from the safe distance of your computer screen and/or phone? At any rate, somehow I stumbled through the rest of the morning, my eyes glazed with fatigue, my clothing revealing sweat stains in inappropriate places, and got everything squared away to wrap up my last day of internship. 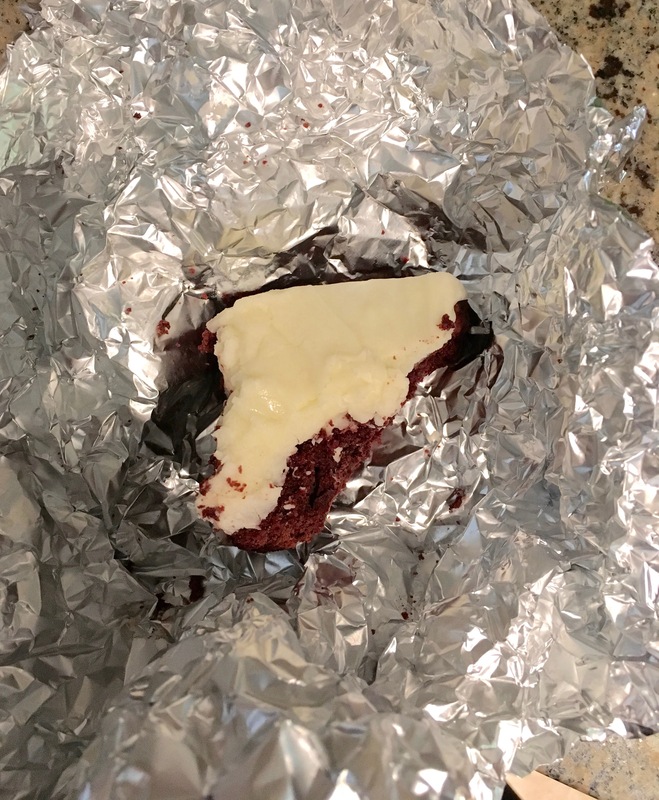 When I finally found myself on the freeway heading home, I had but one thought in my sweaty, stinky head: that there was one last red velvet brownie with cream cheese frosting awaiting me in the fridge at home. It would be my reward for toiling through a morning of labor in the blazing sun on next to no sleep. 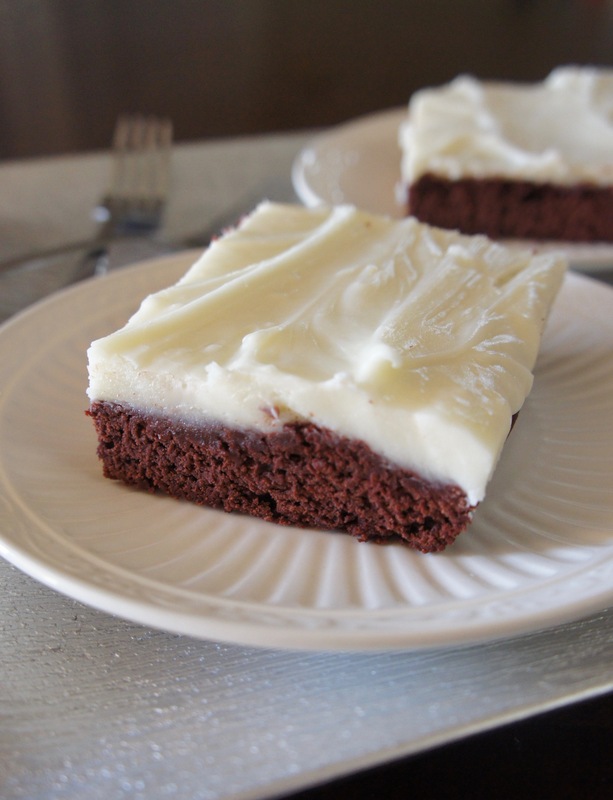 I could almost taste its fudgy richness, the cold give of creamy frosting against my teeth as I bit into it. I got home, paid the sitter, took a shower, had lunch, and went looking for my reward. There may have been tears at this point. Mine, then theirs. Just (sort of) kidding. In a larger bowl, beat together sugar, sour cream, butter, eggs, food coloring, and vanilla. Add dry ingredients to wet ingredients and stir to combine. Pour evenly into prepared dish. Bake 30-35 minutes, or until texture reaches desired fudginess. Cool completely. Meanwhile, beat together cream cheese and butter until no lumps remain. Add powdered sugar, milk, and vanilla and beat until smooth and spreadable. 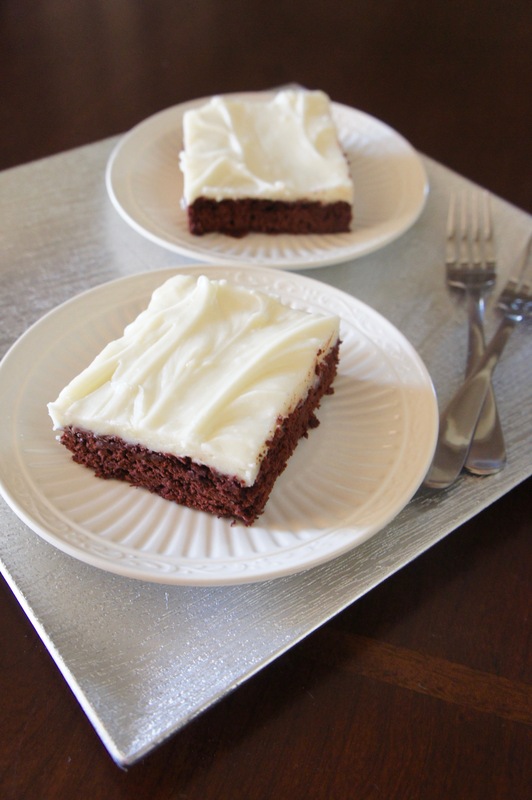 Once brownies have cooled, spread evenly with frosting. Store tightly sealed in the refrigerator.